Local teenagers will benefit from a wellbeing project which teaches them skills to look after their emotional and mental health, thanks to the support of local company, Natures Way Foods. 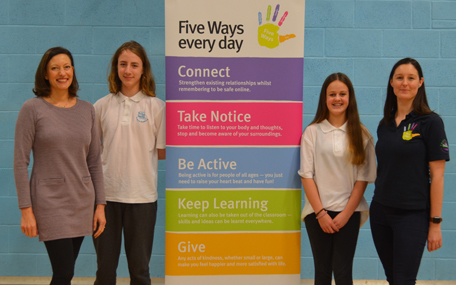 Since October 2017, Natures Way Foods has been working with Chichester District Council's Youth Engagement team to deliver the successful Five Ways to Wellbeing project in local primary schools. This year the project is being offered to secondary school pupils for the first time. The growth of the project follows a successful pilot with a group of young carers of the same age group, which took place last year. All of the young people who took part reported that they learnt new strategies they can use in their daily lives. The project asks young people to focus on five positive actions they can incorporate into their daily lives as individuals and also as part of their communities. Connect: encouraging children to strengthen and broaden their range of relationships and social networks. It encourages them to spend time with their friends and family whilst staying safe on the internet. Be active: stresses that being active is for people of all ages and does not need to be intense physical activity, you just need to raise your heartbeat and have fun. Keep learning: learning can be taken out of the classroom, skills and ideas can be learnt everywhere. Take notice: asks children to take time to stop, become aware of their surroundings and listen to their thoughts and feelings about them. Give: focuses on how giving and receiving acts of kindness, whether small or large, can make people feel happier and more satisfied about life. The workshops are fun, but also a thought provoking way to build confidence, improve positivity and self-esteem. Activities such as brain aerobics help improve memory, further brain function, and concentration. Songs and dances improve co-ordination, team-work, and powerful relaxation. The sessions also touch on internet safety and include a snack and chat session to explore healthy new tastes. The project has been running for three years in the district's primary schools and so far has reached more than 1,100 children across 16 schools. "We are so pleased with the great results of this programme and the positive impact it's having on young people's lives," says Stephanie Jones, Business Insight and Communications Manager at Natures Way Foods. "When we first partnered with the CDC Five Ways to Wellbeing team we talked about expanding to the local secondary schools and it's great to see that this is happening." Councillor Eileen Lintill, Cabinet Member for Community Services at Chichester District Council says: "I am very pleased that we are continuing to work with Natures Way Foods on this important project and that we are now able to offer it to older children in the district. Five Ways to Wellbeing shows children some essential ways to help them look after their emotional wellbeing both now and as they progress in their lives. Today's young people experience a variety of pressure, more than ever before, and as a society we are much more aware of how this affects our young people's wellbeing. Five Ways is about helping children learn how to approach life in general so that they can keep well."